Sunscreen because ranga life – I will get burnt in the middle of winter! 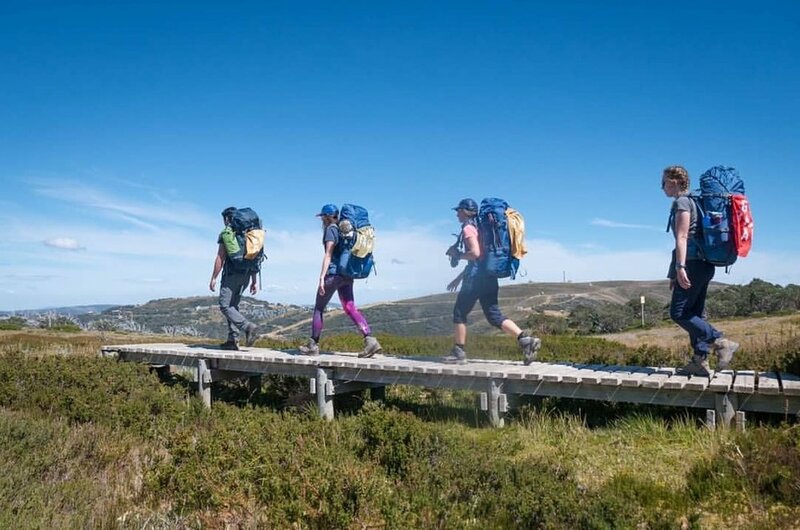 If you’re not used to carrying a heavy pack, keep in mind that the standard is you shouldn’t be packing more than 30 per cent of your bodyweight. Have your pack fitted by a professional. The difference that it makes on the load you have to bear is incredible, especially on those longer hikes. Take note of where you feel the weight most as well; some of us will feel it more on the shoulders than the back than the hips and so on. Always bring the guilty pleasures! For me, that’s a 700ml pop-top rollable bottle filled with a nice Pinot Grigio. It’s a delicious treat to look forward to at the end of a long day slogging it out on the trail. First Aid kit including an emergency blanket...and insect repellant! And dry bags to ensure that nothing gets wet. Epic list aside, everyone will have different must-have items in their packs, just as we all have our own guilty pleasures. I am only a few years into the hiking scene and my pack has already changed so much from those initial adventures. My last piece of advice is to just find what works best for you outside of the bare essentials (water, food, safety, shelter, navigation, light, clothing, sun protection), just find what works best for you and will also make your time on the trails more enjoyable.